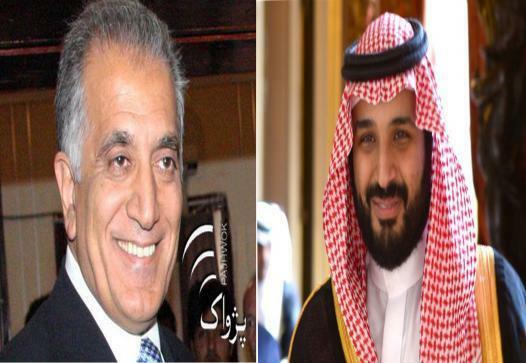 KABUL (Pajhwok): United States special representative for peace in Afghanistan, Zalmai Khalilzad, met with Saudi Crown Prince Mohammed bin Salman bin Abdul Aziz on Wednesday and discussed with him bilateral relations as well as the Afghan reconciliation. The Crown Prince, who is also Vice President of the Council of Ministers and Minister of Defense, met with US special representative for reconciliation Zalmay Khalilzad in Riyadh on Wednesday, the official Saudi Press Agency, SPA, reported. During the meeting, they reviewed bilateral relations between the two friendly countries as well as efforts exerted on the Afghan arena. The meeting was attended by a number of officials. Khalilzad arrived in the kingdom from Pakistan where he and Pakistani authorities agreed to engage Saudi Arabia in pushing forward Afghanistanâ‚¬â„¢s political peace and reconciliation process. Daily Times quoted credible diplomatic sources reported that Saudi Arabiaâ‚¬â„¢s inclusion was discussed during Khalilzadâ‚¬â„¢s day long talks with Pakistani authorities on Tuesday at the Foreign Ministry in Islamabad. Pakistani officials made it clear they had no objection to Saudi Arabiaâ‚¬â„¢s inclusion in Afghan peace process. Ambassador Khalilzad, after completing his talks with Pakistani authorities, left Islamabad for Saudi capital Riyadh on Wednesday. In Riyadh, Ambassador Khalilzad is expected to meet top Saudi security and intelligence officials, besides meeting the political leadership of the Kingdom. A US Embassy spokesman in Islamabad told the Pakistani media that Khalilzad consulted with Pakistani leaders on how best to achieve a durable political settlement in Afghanistan. Peace in Afghanistan is vital to the long-term stability of Pakistan and the wider regionâ‚¬Â, Ambassador Zalmay Khalilzad was quoted as saying by US embassy spokesman in Islamabad. Countries currently engaged in the Afghan peace process are Pakistan, Afghanistan and China while Russia has also initiated a process for Afghanistan and 11 countries have joined it already, including Pakistan, Afghanistan, Iran, China, Russia itself and five central Asian states.